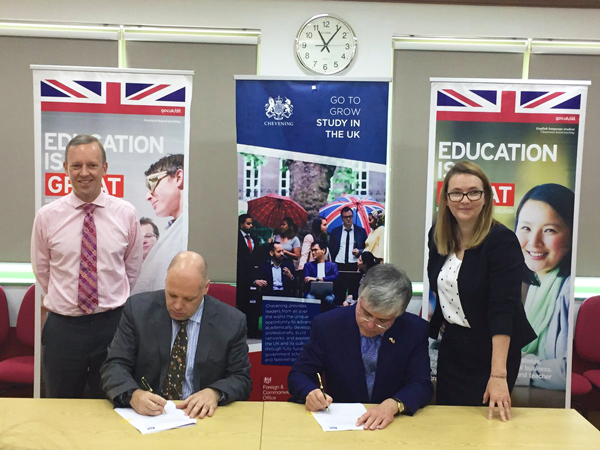 Universities Wales is pleased to announce a partnership with the Foreign and Commonwealth Office on the creation of the Chevening Universities Wales Scholarships. Universities Wales will co-fund up to ten Vietnamese scholars in 2020/2021 and in 2021/2022 to study a one-year taught master’s in any subject at a Welsh university as part of the prestigious Chevening Scholarships programme. 'Chevening scholarships are highly prestigious and celebrated for their role in developing future global leaders. Creating ten Chevening Scholarships for Vietnamese students to study at Welsh Universities will create long-lasting and mutually beneficial links between Wales and Vietnam. These scholarships will boost student mobility and students will act as international ambassadors for our countries. 'The Chevening Scholarships programme brings together young professionals with the potential to develop into future leaders in their chosen field. They are selected from around the globe to study at the UK’s world-leading universities. 'We are proud to announce this partnership during Chevening’s 35th anniversary year, its 25th anniversary in Vietnam, and during the anniversary of 45 years of diplomatic relations between the UK and Vietnam. Chevening collaborates with a number of universities, governments and private sector organisations from around the world to support and enhance the experience of our Chevening Scholars, Fellows and Alumni. For 35 years, Chevening and its partners have helped to build bridges with more than 160 different countries and territories, supporting the education and development of future leaders, influencers, and decision-makers across the world. Scholars will join an international network of over 50,000 Chevening Alumni when they graduate, many of whom have developed into influential leaders across all sectors since the programme started in 1983. Applications for the 2020/2021 academic year will open in August 2019.